Ladakh is a high altitude cold desert which receives very little presipitation and is generally dry with little vegetation only around river valleys. Leh is its largest town, directly connected to Srinagar via National Highway 1D and to Manali via Leh-Manali Highway. These highways are closed during winter, but the internal roads of ladakh are generally open throughout the year. As a result outside access to this valley is not possible suring winter. Summer here are quite warm, and winters are cold and harsh. Nubra Valley is a tri-armed valley situated in the north east of Ladakh and south of the Karakoram ranges. The ancient Nubra kingdom had its capital at Hunder. The road from Leh to Nubra valley goes over the high Khardung La, 17,582 ft. Some of the highlights of this place are the Chamba Gompa, Diskit Gompa, Maitreya statue, the sand dunes between Hunder and Diskit. You can sometimes see the two-humped Bactrian camel grazing on seabuckthorns here. You can also visit the Baigdandu village which is famous for its goats that give us Pashmina shawls. 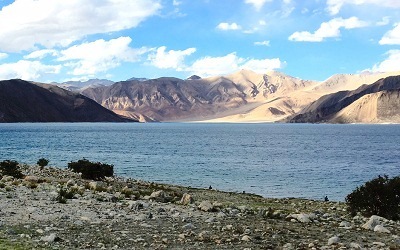 Pangong Lake, a beautiful endorheic salt water lake situated to the east of Ladakh at a height of about 14,270 ft is another major attraction of Ladakh. At its broadest it is 5 km wide and 134 km long and falls in both India and China. The lake freezes completely in the winter season. You will need Inner Line Permit to visit the lake as the Sino-Indian Line of Actual Control passes through this lake and also boating is not allowed in this lake. 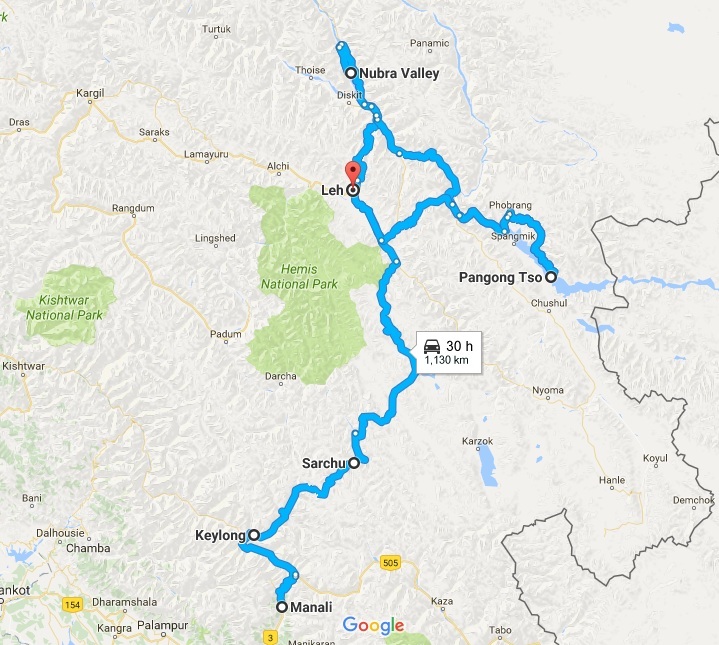 It is quite a difficult route as the rides can be long and rough and roads unmetalled.You will be crossing some very high altitude passes and need to take care against AMS or height sickness. In case it rains temperature can fall to freezing cold, so you will need to carry with you appropriate waterproof clothings and warm inner wears. Any beverages like bottled water, juice, tea, coffee etc. Any other item of personal nature like room service, laundry, tips, porterage, phone calls etc. Anything not exclusively mentioned in the Includes section. Nomad Bikers cannot be held liable in case the tour is affected because of weather,	political, or any other conditions. Any additional	expenses incurred due to the same would be borne by the participants. In case of any increase in prices due to increase in government taxes, entrance fees, intra or inter state taxes etc, the tour price will be revised. In case of any mishap, if the Road Captain is unable to ride then the mechanic would take his place, as he is also an experienced rider. The itinerary lists the places we will be covering during the trip. Where we stay and how much we travel in a day is just indicative and is subject to change depending on weather condition. We have kept few days extra in order to account for bad weather, road blocks, unscheduled halts, acclimatisation,	local sightseeing etc. 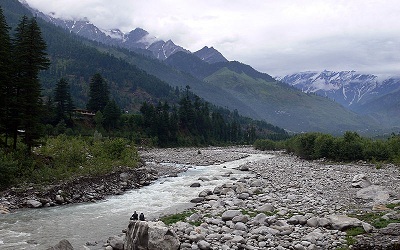 Manali is a small town located on the banks of Beas river. Solang Valley, Naggar Castle and Vashisht Hot Springs are some of the places to visit if time allows. Stay at hotel in Manali. You will receive a warm welcome on arrival at Manali. Check in to hotel. Meet the team. Local sightseeing. Overnight stay in hotel. Keylong is the administrative centre of the Lahaul and Spiti district in the Indian state of Himachal Pradesh. It is located along the Manali-Leh Highway, near the intersection of Chandra Valley, Bhaga Valley and Chenab Valley; on the banks of Bhaga River. 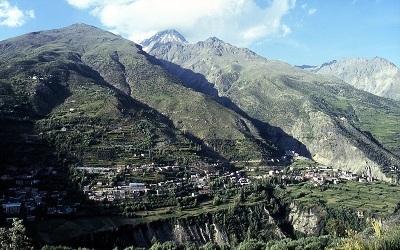 Among the white and brown mountain in the region Keylong stands out as oasis of greenery in the district. Keylong faces the famous Kardang Monastery, the largest and most important monastery in Lahaul. It is located on the Leh-Manali highway after crossing the Rohtang pass, at 13,054 feet. Overnight stay at hotel. 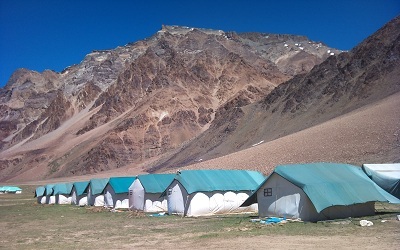 Sarchu (also known as Sir Bhum Chun) is a major halt point with tented accommodation in the Himalayas on the Leh-Manali Highway, on the boundary between Himachal Pradesh and Ladakh, Jammu and Kashmir. It is situated between Baralacha La (16040 ft) to the south and Lachulung La (16,600 ft) to the north, at an altitude of 14,070 ft.
Leh is the capital of the Leh district in the Indian state of Jammu and Kashmir. The town is dominated by the ruined Leh Palace, the former mansion of the royal family of Ladakh. Mountains dominate the landscape around the Leh. 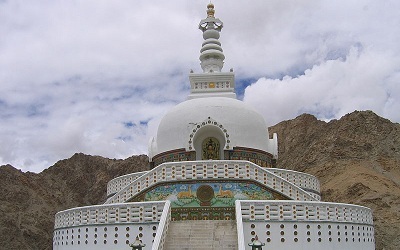 We halt at Leh and do some local sightseeing and get used to the high altitude climate. Nubra is a tri-armed valley located to the north east of Ladakh valley. Diskit the capital of Nubra is about 150 km north from Leh town. We cross the famous Khardung La pass to reach this place from Leh. 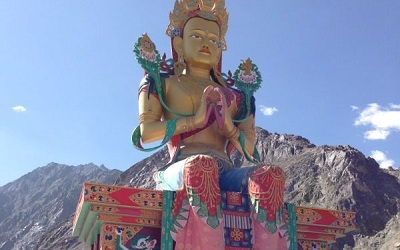 The 32 metre Maitreya Buddha statue is the landmark of Nubra Valley and is maintained by the Diskit Monastery. Samstanling monastery is between Kyagar and Sumur villages, and Panamik is noted for its hot springs. Across the Nubra or Siachan River at Panamik, is the isolated Ensa Gompa. On the Shyok River, the main village, Diskit, is home to the dramatically positioned Diskit Monastery which was built in 1420 AD. Pangong Lake, is an endorheic lake in the Himalayas and extends from India to China. Pangong Tso can be reached in a five-hour drive from Leh, most of it on a rough and dramatic mountain road. The road crosses the villages of Shey and Gya and traverses the Chang La, where army sentries and a small teahouse greet visitors. Soak in the beauty of the place and the blue waters of the lake. Stay at nearby camps. End of trip. Local shopping and you go back with loads of memories. Village Khatrod, P.O. Panyali, Tehsil Nadaun, District Hamirpur, Himachal Pradesh, Pin - 177040. India. 21, J.K. Chambers, Sector-17, Vashi, Navi Mumbai, India.